SIGIL stands for Sound, Input, and Graphics Integration Library. It is meant to be a mind-bogglingly simple alternative to other, more complex libraries when all you want is to make a small game, teach basic 2D graphics, or otherwise remove the complexities of media programming from your C or C++ code. It's also cross-platform! It's designed to be really easy to use. Here is a simple example program demonstrating sprites, text, rectangles, and lines. Cool! What platforms does SIGIL support? At the moment, SIGIL supports MinGW32, MSVC 10 2010 (32- and 64-bit), MSVC 11 2012 (32- and 64-bit), MSVC 12 2013 (32- and 64-bit), MSVC 14 2015 (32- and 64-bit), Linux GCC, and the Raspberry Pi. 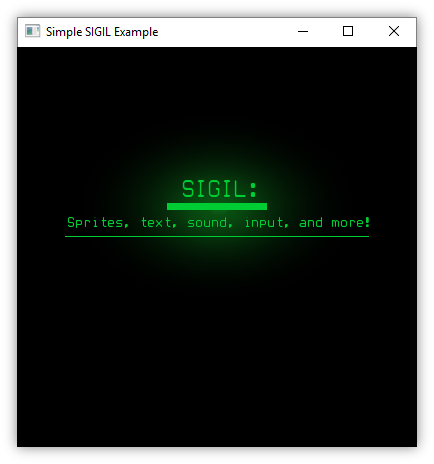 Plans are underway to make SIGIL increasingly cross-platform. Where can I download SIGIL? Calm down! Source code is available on GitLab . How do I use SIGIL? on the Raspberry Pi, you can use the Linux CodeBlocks guide above, or start with a sample Makefile. Do you provide any examples? You bet! There are several self-contained SIGIL example projects available on GitLab , for every compiler that SIGIL supports. I have a feature request/bug report/semi-helpful comment. Who do I pester about this? You can contact the project developer, Geoff, at geoff@libsigil.com. Page last updated Jan. 11, 2018.